US, 1939, 87 minutes. Black and white. Groucho Marx, Chico Marx, Harpo Marx, Kenny Baker, Florence Rice, Eve Arden, Margaret Dumont, Nat Pendleton, Fritz Feld, James Burke. At the Circus was one of the many excellent films of the peak year in Hollywood, 1939. 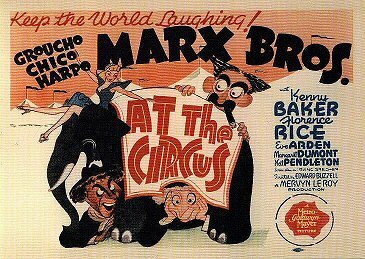 At the Circus follows the Marx Brothers’ success in A Night at the Opera and A Day at the Races. The next year they were to make Go West, then The Big Store. This was their peak period at MGM, and the films were given all the lavish MGM treatment. The film was written by Irving Brecher who wrote Go West as well as a number of popular MGM comedies and musicals of the 1940s. It was directed by Edward Buzzell who was to direct Go West and directed a number of amusing and slight MGM comedies. The film is worth seeing, of course, for the personalities of each of the Marx Brothers, their working together, their distinctive styles. Groucho Marx is an attorney, Loophole, and gets away with all kinds of wisecracks and puns. He also has to encounter, once again, Margaret Dumont, play up to her, flatter her, ridicule her. She plays along as always, seeming to enjoy herself – even though, at the end, she is one of about four people at the circus swinging from a trapeze and losing her skirt in the meantime. She never loses her dignity. People consider her almost as the fourth Marx Brother because she appeared in seven films with them. Also in the cast is Eve Arden, part of the criminal plot, who has some wisecracks as well as a romantic scene with Groucho. As with the other films, there is a romantic subplot which many audiences may get impatient with as the years go by. Kenny Baker made a few films but was very popular as a singer on radio. Florence Rice appeared in a number of films for a career of ten years from the mid-30s to the mid-40s. There is something of a plot, similar in a sense to that of The Big Store. Kenny Baker portrays the owner of a circus who owes his partner ten thousand dollars. The deadline nears and the partner wants to take over the circus. Chico portrays one of his assistants and calls in Attorney Loophole. The Marx Brothers investigate what happened when the owner’s money is stolen. Of course, it has been stolen by the partner using the strong man of the circus (Nat Pendleton) and the dwarf of the troupe (Jerry Maren). Groucho also gets to sing Lydia the Tattooed Lady, a showstopper in the film where he is assisted by Chico and Harpo. Chico gets the opportunity to play the piano in his usual style – always a showstopper as well. And Harpo plays the harp – but, as in A Day at the Races, he has a musical ensemble with a whole lot of black children. Given the situation of films in the 1930s, Harpo Marx’s outreach to black singers was more significant than may be thought now.